If the name Malvina Reynolds isn’t a familiar one, you’ve probably heard her music before. Her song ‘Little Boxes’ has had a second life in commercials and as the theme song to the show ‘Weeds’. Born in 1900, Reynolds herself was a pioneering singer songwriter, leftist/feminist, having worked as a musician before getting her masters and doctorate in the late 1930s, and only really devoting herself to music (again) in her late 40s. Pete Seeger popularized ‘Little Boxes’ her paen to the deadening uniformity of suburbia, and she went on to record her first LP for Folkways in 1960, and then her most popular album (from whence today’s selections come) for Columbia in 1967. 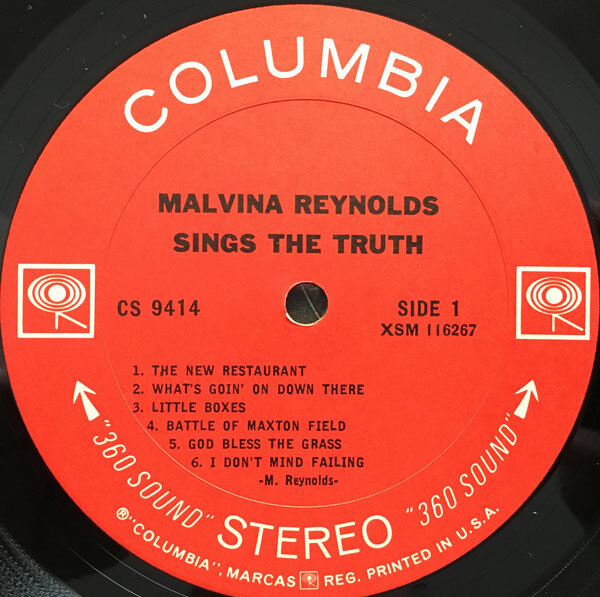 ‘Malvina Reynolds Sings the Truth’ is a quiet, low-key (yet razor sharp) masterpiece of poetic social commentary. The first few times I listened to the album I found my brain trying to wrap itself around the music, and continually slipping off, until – that is – I figured it out. I walked into the listening session expecting a ‘folk singer’, which in some basic ways, Reynolds is, yet the content of the music reveals her to be so much more. Here we have a woman, well into her 60s, presaging an uncompromising take on what would soon be labeled ‘singer/songwriter’ music. Yet Reynolds, really – if not sui generis – is far enough out that the group of musicians she belongs to is almost imperceptible unless you cast your net wide enough to include the likes of Jake Thackray. Her songs are literary, in an almost Raymond Carver-ish way, ironic, symbolic and philosophical. The two songs I picked to bring you today are ‘The New Restaurant’ and ‘I Don’t Mind Failing’, both in their own ways, meditations on modern society. ‘The New Restaurant’ is an almost circular song, singing the praises of the fancy, superficial accoutrements but always coming back to the idea that in spite of all the flash the restaurant has failed at its most basic mission, i.e. FOOD. ‘I Don’t Mind Failing’ is a testimonial to the power of just living your life, a cry against Trumpism 50 years before it’s rise. 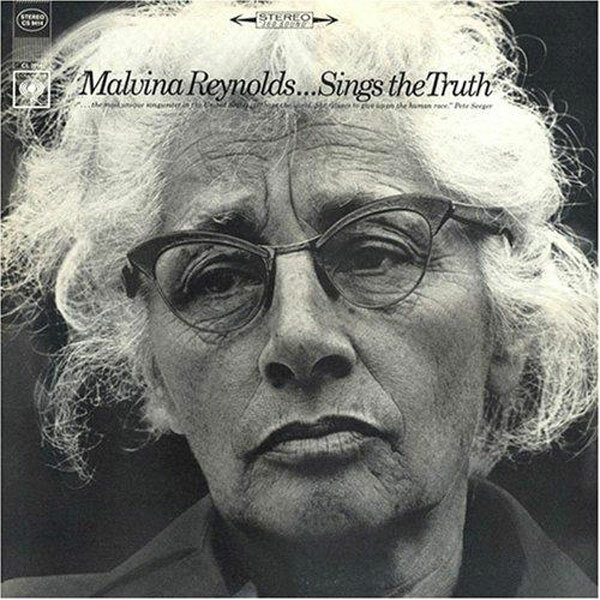 Malvina Reynolds may not be for everyone, but I find the more I listen to this album, the deeper it gets. I hope it works that way for you, too.